Sally Anderson, 27, from Sydney NSW has won the 2017 Brett Whiteley Travelling Art Scholarship. 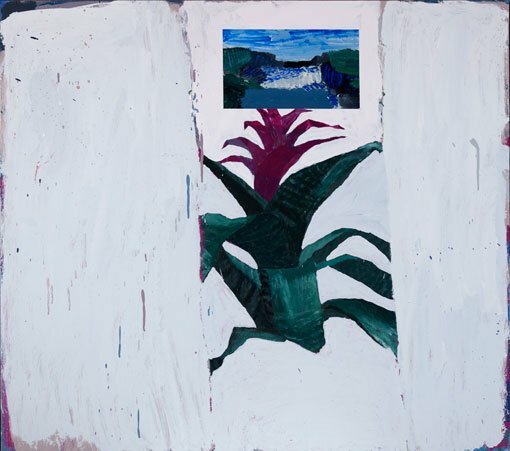 Three paintings – Dilling’s Bromeliads with Gullfoss Falls , Deegan Drive hydrangeas with Guy’s painting of Robertson and Hydrangeas sitting on Mirra’s lilies (balancing still life) – from Anderson’s winning body of work are on display at the Brett Whiteley Studio alongside works by finalists Tim Buckovic, Madeleine Cruise, Annalisa Ferraris, Holly Greenwood, Charlie Ingmar Harding, Andrew Hopkins, India Mark, Peta Minnici and Nick Santoro. Begun in 1999, this scholarship for young Australian painters is now in its 19th year. This year’s judge was artist Ildiko Kovacs, who selected this year’s winner from ten finalists, shortlisted from 131 entries. Anderson has won $40,000 and a three-month residency at the Cité Internationale des Arts in Paris, which is administered by the Art Gallery of NSW.